My grand daughter Brooklynn. 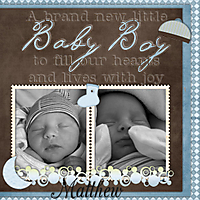 Using the adorable Quentin & Emma kit by Graham like the cracker. *The kitchen is my second home* I love the paper layers on this one. What a cutie your grand daughter is. *Master in the kitchen! * Great LO! 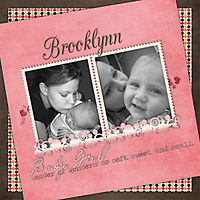 I love the cute b/w photo edit, the cute word art, and the cute frame. Awesome job! Love the layered papers!